The Lilly Family School of Philanthropy brings together scholars, professionals, and benefactors who are committed to understanding and practicing effective philanthropy. Faculty research identifies emerging trends, tests conventional beliefs and practices, and provides insights into giving that expand the understanding of philanthropy. The pioneering work of our faculty and students has established the school as a leading authority on charitable giving. 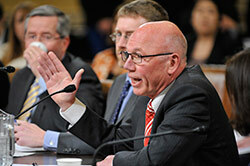 This recognized leadership within the nonprofit sector compelled Congress to call on Gene Tempel, the school’s founding dean, to testify at proceedings for charitable tax reform. Our Stead Chair Lecture Series focuses on the growing field of international philanthropy. This program brings world-renowned leaders to campus to share their knowledge and experiences. Speakers have included Helmut K. Anheier, president and dean at the Hertie School of Governance in Berlin, Germany; and Kenneth Prewitt, Carnegie Professor of Public Affairs at Columbia University. 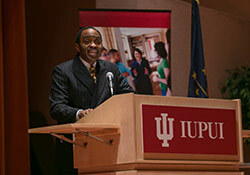 And many other leaders in the field have shaped our students: Emmett D. Carson, CEO and president of the Silicon Valley Community Foundation (the nation’s largest community foundation) served as the first individual to hold the school’s Visiting Charles Stewart Mott Foundation Chair on Community Foundations. Jean Case, co-founder of the Case Foundation, and Aaron Dorfman ’03, executive director of the National Committee for Responsive Philanthropy, have delivered remarks during our commencement ceremonies, offering invaluable and inspiring insights to our graduates. The nonprofit sector has the potential to solve some of the most complex and troubling problems in American society and across the globe. By convening the industry’s biggest minds, the Lilly Family School of Philanthropy meets a core responsibility to inform students, faculty, and the community, and to challenge current thinking. Ongoing support for symposia, lecture series, and visiting professors will ensure that we maintain our close association with others in academia and in the practice of philanthropy.